Love the pics you are painting of them. 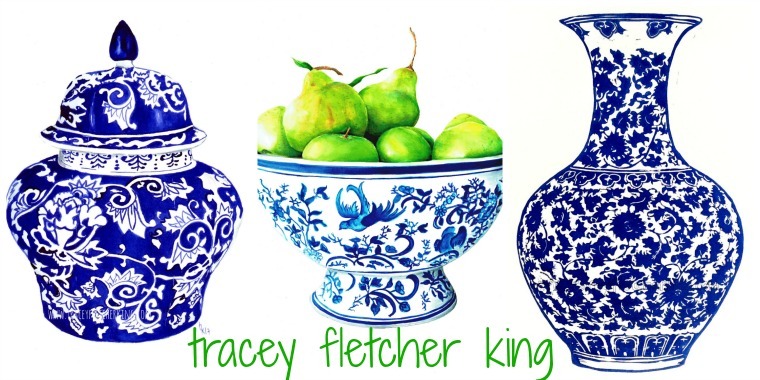 You have sketched them perfectly, Tracey! Now I know they also taste great, I will definitely be getting me some. I'm curious to know what's under the pretty plastic wrap?? Autumn arrived on March 1st but it doesn't feel like it. Love the way you write! "...the self control ship has now sailed baby..." made me smile. Your sketches and paintings are beautiful. 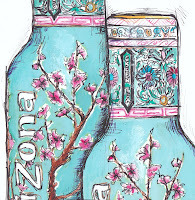 I'm with you on the Arizona tea thing, too, though my favorite is their raspberry tea. I try not to buy it as it is so addictive! They make the bottles so pretty to lure you back to it! You did a very pretty painting of it too! Oh I love these too! Especially the Blueberry ones. Actually, I don't think I've ever tried any of the other flavours, the blueberry one's just too lovely. They only came here a few years ago, in glas bottles and very expensive, and only available in expensive deli supermarkets. But I've seen them now in some regular supermarkets, at half the price. Hmmm I think now I'll have to go and find one tonight! Wonderful paintings, they're such nice bottles as such, and your paintings are just perfect! You do make me chuckle :) Love reading your posts. 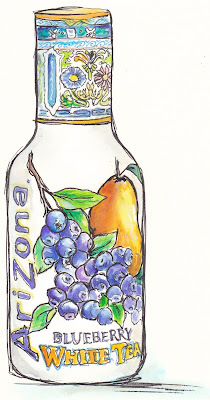 We don't have these in the UK....but those bottles are gorgeous - so pretty - and crying out to be drawn and painted. Lovely pictures. No Arizona Iced Tea over here. Those bottles are so colorful and all the detail! Love them! Love these sketches. Arizona has the greatest bottles, but that stuff is legal crack, it ought to be a controlled substance. 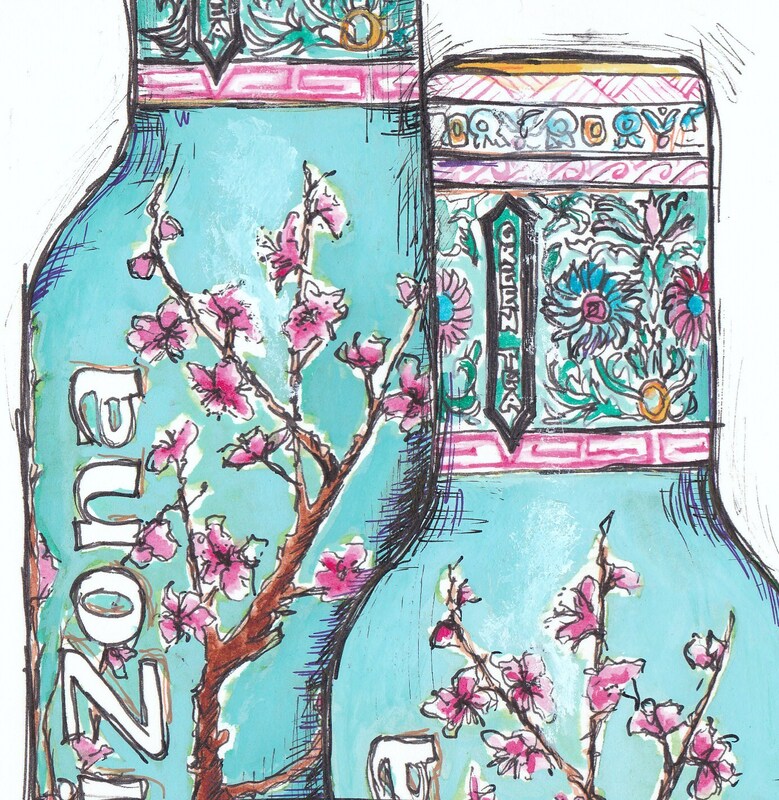 I've always loved Arizona Tea's bottles. I could easily get addicted for that reason alone. Your paintings of the bottles are so good. 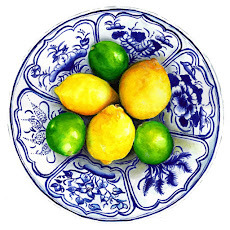 Love these images and post! love these bottles! so decorative. Hi Tracey. Excellent post and great work on the Arizona bottles. We have them here too, but I've never bought any. Now you got me wondering about them. You've done a fantastic job on them. Shows how much you love your tea. :)) Have a great weekend. Enjoyed this post much. What an extraordinary work you did, as always!!! I love all the details you put in your work. They are beautiful. "the self control ship has now sailed, baby".... LOL! This really made me smile! I do love the green tea with honey also although not as much as a coke zero which I'm certain way worse for a person! So drink up, it could be worse ;) Your bottles are beautiful! Happy PPF! Love your rendition of the bottles! Very alluring. In terms of falling off the wagon, it could be far worse, LOL. Oh wow, these bottles are gorgeous and your paintings are so pretty. The detail and colour is amazing. Ah, Tracey you crack me up. It's not your fault....I blame those gorgeous bottles. And you've captured them beautifully. I have long thought they were beautiful bottles but have never bought one. Ha! I'd be tempted just by the pretty bottle. I've never seen them in the UK... sounds like a good thing! I love your post, Tracey. 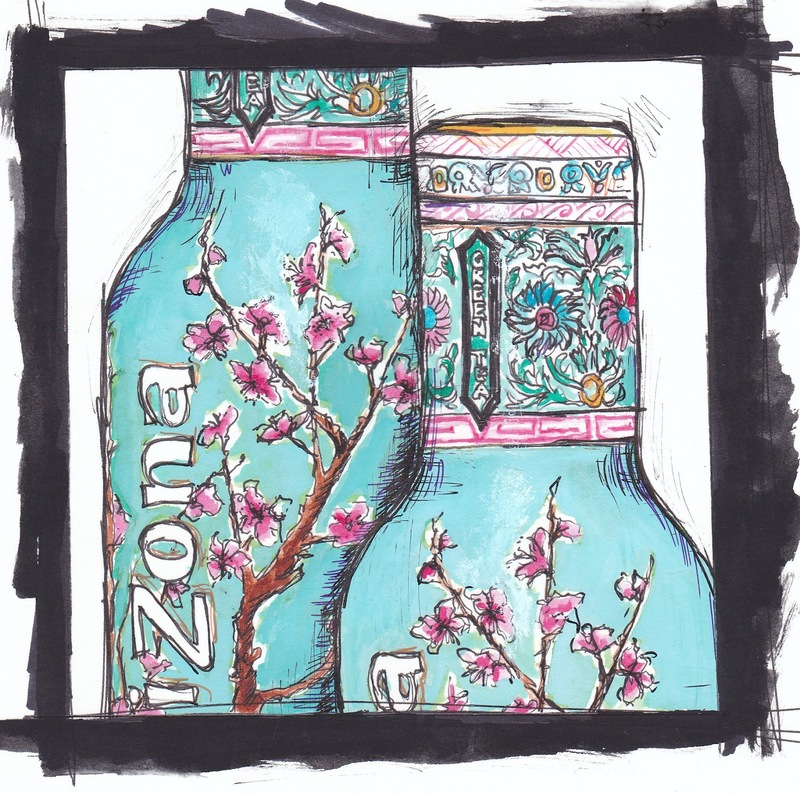 Beautiful paintings of the Arizona tea bottles. I've never had any. I do drink a lot of iced tea, year round. I prefer Luzianne brand for its robust flavor. Tea is good for you. 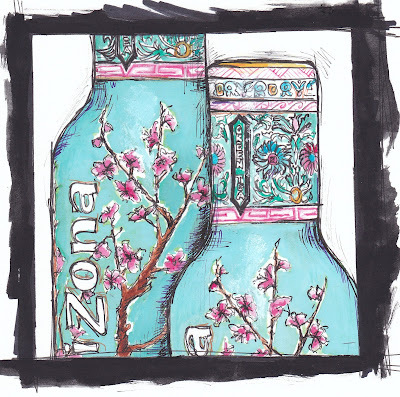 If Arizona tea is really tea then it can't be all bad. Painting them looks like a great alternative. :) They look fabulous! these are great paintings, and I really really relate to this post! your sketches are so nice, they make me thirsty! they should hire you to do some of their brand marketing, seriously! The line work is so expressive and full of energy. Well Done! Don't they have the best colors?? I love the bottles too! And your work is just delicious! Lol! Your post made me laugh, beautiful paintings of the bottles! It is rather a pretty bottle - I have that same problem with Red Bull now... (very bad habit). Gave them up when I was pregnant and breastfeeding my kids but was really tired one day and picked one up for an energy kick. Can't go on a drive now without one! whew! way to talk yourself off the ledge! it is great stuff though....and your paintings are fab, as usual...happy PPF! Oh, my gosh! 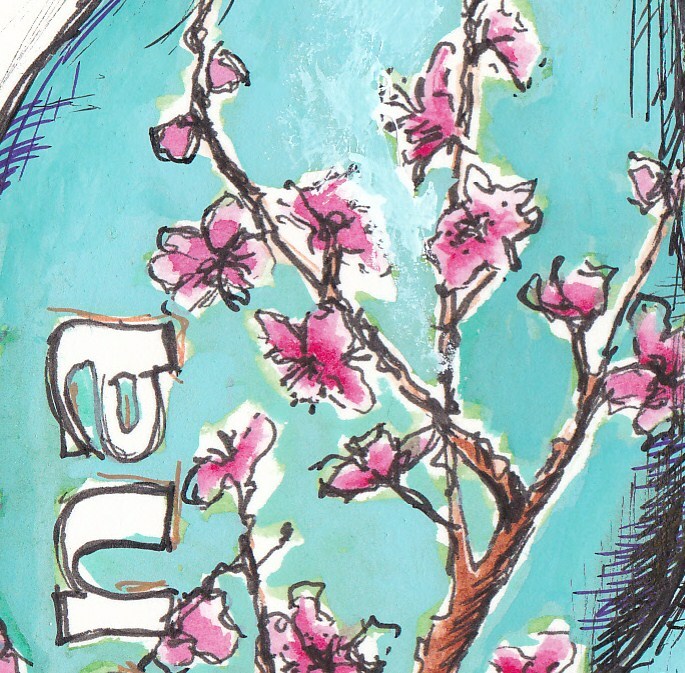 Your paintings of those tea bottles are gorgeous! I'm from the deep South (Miss.) and know what you mean about sweet tea. Now that I live in Michigan, sweet tea is an anomaly! 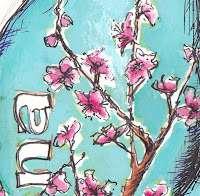 : ) I have converted to artificial sweetener and lemon, but still love my tea! But your paintings are truly fabulous! Thanks for sharing. So gorgeous..your bottles are totally dazzling and very beautiful! And the bottles are beautiful, too. Heh sorry to hear you're off the wagon again. 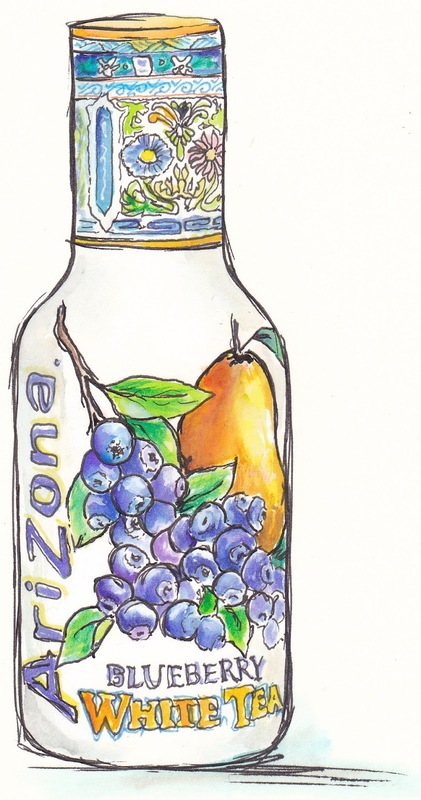 But I absolutely love how you beautifully captured the art on the bottle, which used to be my reason for buying it. 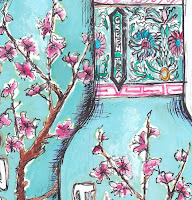 This is so beautiful- I love those bottles AND the fact that you're painting them is GREAT! I'm the same way with coffee- I MUST have it ALL day, every day.....keeps me chipper! You have rendered the tea bottles beautifully, absolutely great job! And your post made me smile, not a very dangerous addiction and I'm sure you will be on the wagon again shortly ! Hey eat and drink what you like. We only live once on this earth. Beautiful sketches and oh...so tempting! Now I will think of this post every time I pass by a bottle of Arizona tea. I am the same way when it comes to my morning cup of coffee. We get a special kind from our local spice merchant called Kookie Koffee. It is so irresistible, but I really don't need the calories or the caffeine. 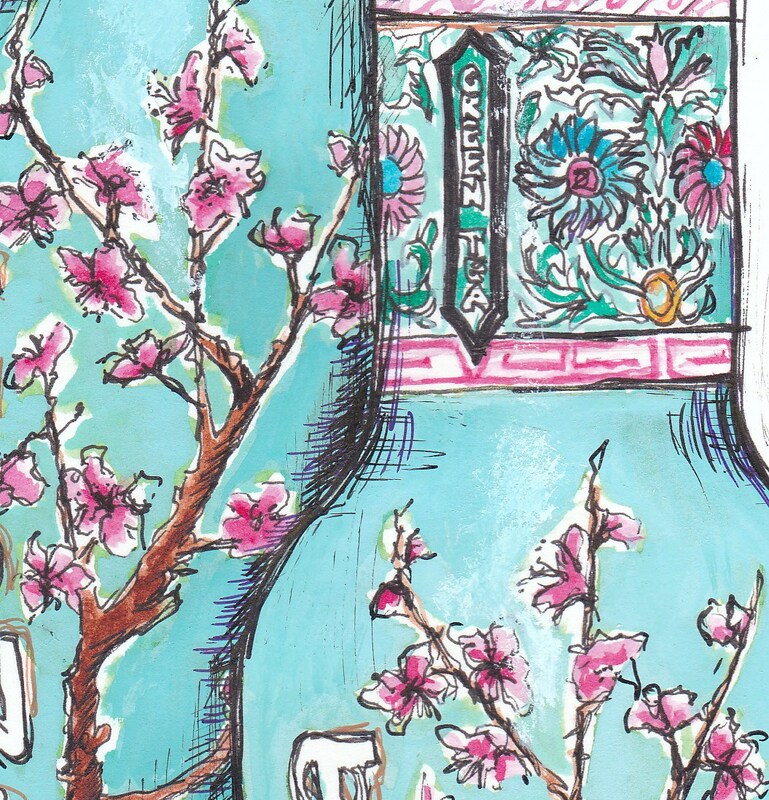 Best of luck kicking the habit, but please keep sketching the beautiful bottles.